Accompanying smoke inhalation can also cause serious issues, from difficulty breathing to carbon monoxide poisoning, inflammation, scarring of lung tissue, asphyxiation and death. 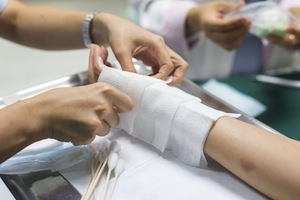 Burn injuries often require intensive and lengthy wound care therapy along with multiple rounds of skin grafts and other surgeries. It is not uncommon for a serious burn injury victim to spend a year or more in the hospital. Even so, victims may still live with permanent scarring or significant disfigurement, as well as lingering pain and limited sensory or motor ability. Emotional and psychological injury in many cases meet the criteria for diagnosis of post-traumatic stress disorder and other serious and debilitating mental conditions. Facial scars can also result in difficulty finding a job, and reduced earnings over the victim’s career. Attorney Robert N. Katz and the lawyers at the Atlanta law firm of Katz Wright Fleming Dodson & Mildenhall LLC have decades of combined experience representing victims of car, truck and motorcycle accidents, defective products, medical malpractice and other types of serious accidents and injuries. Our firm has a record of success obtaining compensation for people who have suffered some of the most serious and catastrophic injuries. In the Atlanta area, call us at (404) 460-0101, or call toll-free from anywhere in the United States at (404) 460-0101. You can also contact us online, and we will get in touch with you right away. If you or a loved one has suffered a burn injury, facial scar, or other serious injury due to the negligence or misconduct of another, contact Katz Wright Fleming Dodson & Mildenhall LLC for a free consultation with a skilled and compassionate attorney who is ready to help you.